Churchdown Hill and the Battle of Tewkesbury…. The Gloucestershire village in which I live, Churchdown, is down in the Vale of the Severn, at the foot of the Cotswolds. 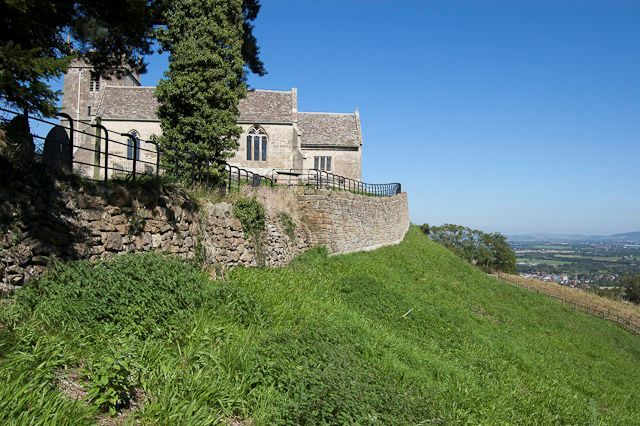 It is dominated by one of two outlier hills in the area, Churchdown (or Chosen) Hill and Robinswood Hill. Both are on the outskirts of the city of Gloucester. Churchdown Hill, an Iron Age hill fort, boasts an early mediaeval church, St Bartholomew’s, which is visible for miles around, including from the M5. Both church and hill are landmarks. The above picture gives some idea of the church and hill, with the panorama of the vale visible on the right. The view stretches for miles, and the Malvern Hills are easily seen. Why am I writing about this in Murrey and Blue? Because the hill has a connection with the Battle of Tewkesbury, 4th May 1471, when the Lancastrians were crushed and Yorkist Edward IV was firmly on his throne at last. During the build-up to the battle, bad weather drove Margaret of Anjou and her invading Lancastrian army ashore at Weymouth. On the same day another Lancastrian army was crushed by Edward at Barnet. She decided to march into Wales, where one Jasper Tudor had raised yet another Lancastrian force. If she joined with him, they could surely overwhelm Edward, who was in London. When Edward received information about Margaret’s movements, he raised his own army again in double-quick time (not easily done as he’d let many of them go after the victory at Barnet). Then he set off for the west to defend his throne again, with Richard of Gloucester at his side. They intended to meet up with George of Clarence, who was rejoining his brothers after disloyally deserting them to further his own ambitions with the Earl of Warwick. There was almost a battle at Sodbury Hill, just northeast of Bristol, but Margaret and her Lancastrians marched swiftly north through the night, passing close to Edward’s unknowing army. By morning they had reached Berkeley Castle, in the Vale of the Severn. Their aim was to cross the river, but it’s wide and tidal at this point. The nearest bridge was at Gloucester, and that was where Margaret made for next. But Edward was on to her now, and sent instructions to the Governor of Gloucester that he was to close the city gates to the Lancastrians. This was done and Margaret could not gain entry. She had precious little time now, because Edward was coming up behind her, and so she had no option but to march on north, toward Tewkesbury. This is where Churchdown Hill plays its part in the story. It was a vantage point par excellence, and Edward sent his scouts to the top to see exactly what the Lancastrians were up to. From there they watched Margaret being refused entry to Gloucester, and then the commencement of the march north. The church of St Bartholomew was there then, and perhaps the bluebell woods as well, for it was bluebell time. Or maybe the hill was bare, except for the church. Whatever the hillscape, it provided Edward with all the help he needed to put an end to Margaret of Anjou’s ambitions for her son, the Lancastrian Prince of Wales, another Edward. It would be good to think that Richard accompanied the scouts to the hilltop, and shaded his eyes against the sun as he observed the enemy. But perhaps that would be too much to hope. 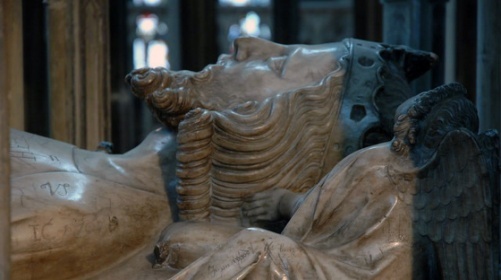 The Battle of Tewkesbury was decisive, and secured Edward on the throne for many years to come. It also proved his young brother Richard to be a fine soldier and strong leader. George of Clarence was never fully trusted again, but at Tewkesbury the three York brothers were united. This union did not last, of course, and George continued to be troublesome. Eventually he paid the ultimate price for letting Edward down once too often. Richard, of course, was loyal and faithful to the end. April 1483, another springtime, brought Edward’s untimely death, and many unwelcome truths about his private life. Those truths changed Richard’s world forever, and brought about his own untimely death at Bosworth. I blame his cruel demise as much on Edward as Henry Tudor, Margaret Beaufort et al. If you wish to learn more about St Bartholomew’s church, please visit the following site: https://www.standrewschurchdown.org.uk/new/history Better still, visit the church itself, which is very beautiful, and is reached up a narrow, steep lane that cannot have changed much in hundreds of years. There is a car park at the top, so do not fear having to accomplish that lane on foot. Unless you want to, of course! So difficult could access be in bad weather, and for those no longer young and spry, that a second church, St Andrew’s, was built down in the village. But St Bartholomew’s stands proud on its outlier, and every morning, when I open my door, I can look right up at it. A great sight to enjoy. Another great site is http://sulismanoeuvre.blogspot.co.uk/2012/11/the-chosen-hill-church-scratchings.html, where I found the above photograph. There are many more pictures and interesting facts about the graffiti at St Bartholomew’s.